It should be no secret that voracious readers love their local library. 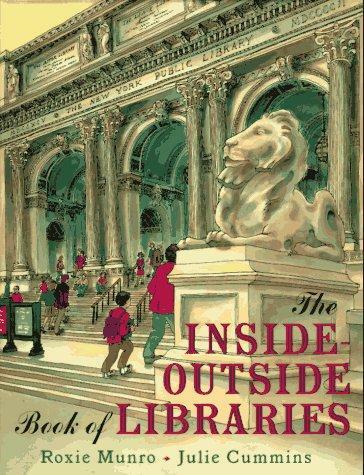 This book, The Inside-Outside Book of Libraries by Roxie Munro shows the child different libraries around the United States. This non-fiction, picture book is a collection of various types of libraries, what state and city they are in, and gives a description of why that library is a necessity to its patrons. I really enjoyed reading this to my children. I learned a lot about a few of the libraries I'd never heard of before, including the Andrew Heiskell Library for the Blind and Physically Handicapped, which is in New York City. This spread included a passage in brail, which my children enjoyed learning about. I also loved seeing a tool library (yes, you read that right!) called The Tool Lending Library in California. My husband and I had thought of this idea a few years ago and wanted it to be a home/garden co-op, but other than a few members, it never got off the ground. I now know there are actually these types of places in existence, where you can borrow any type of tool for 3 days before returning it. The illustrations in this book, by Julie Cummins, are detailed and muted in color. There are two two-page spreads describing and showing each library. The first spread is about the outside of the library, while the second is what the library looks like on the inside (hence the title). As an avid library enthusiast, I am a fan of any kind of library: small and specialized or large and unique. I would happily recommend this book to others, especially in mid-April, when National Library Week is celebrated. Happy reading!